November is a great month to visit New York City. It begins with the New York City Marathon, features the Macy's Thanksgiving Day Parade (both are iconic events worth experiencing in person), and, by the end of the month, the city is transformed into a holiday-inspired wonderland, complete with a tree in Rockefeller Center, many holiday window displays, and a trio of holiday markets spread across the city. The weather is starting to cool off, so there're no fears about sweating through your clothes and you won't be shivering as you wander the city. Winter tourist season starts to pick up at the end of the month, so be prepared for crowds around major tourist attractions like the Herald Square Macy's and the 9/11 Memorial. November is a great month to visit the Big Apple. The weather is pleasant for getting out and hitting some of the city's many attractions or for checking out the colorful fall foliage in Central Park. New York City weather in November can get chilly, especially after the sun sets, but snow is unlikely. Expect seven to 10 rainy days during the month. There usually aren't any torrential rains, but an umbrella or rain jacket might come in handy. If you're visiting for the beautiful fall colors in Central Park, note that most of the leaves are gone by the end of the month. If you'll be visiting New York City in November, pack some fall favorites but don't forget a few winter essentials. A scarf, hat, and gloves will make life more comfortable in the evenings and later in the month when it gets chilly. Other good clothing items to bring include sweaters or hoodies, long pants, an insulated windproof jacket, and a small umbrella. With all the walking you'll do in New York City, comfortable footwear is a must. Make sure your shoes are built (and broken in!) for walking, closed toe, and water resistant. After Thanksgiving, the city transitions into winter holiday season and many of the big events are holiday-centric. But travelers who visit early in the month can catch the marathon, the New York Comedy Festival, or watch the country's biggest Veterans Day parade. 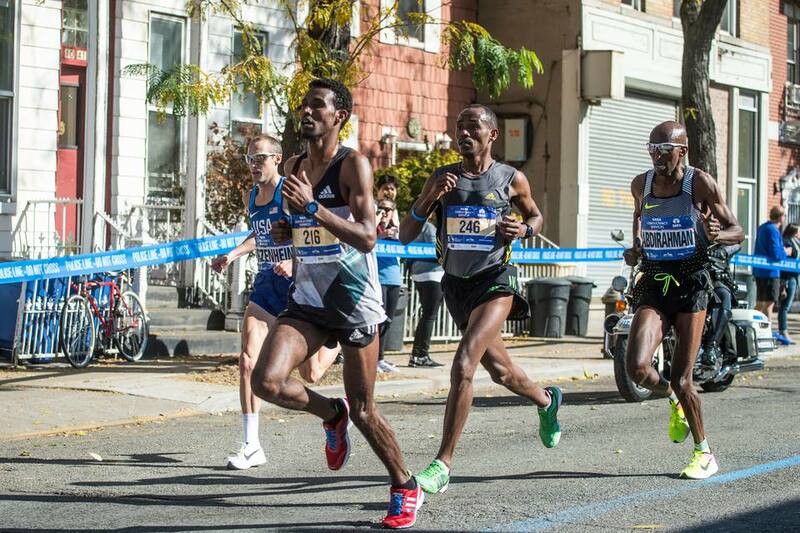 New York City Marathon: The marathon began in 1970 in Central Park and now goes through all the city's five boroughs. It's the world's largest marathon with approximately 100,000 applicants. Only half typically finish. New York Comedy Festival: This weeklong festival showcases national headlining comedians performing in some of the city's greatest venues such as Carnegie Hall and Madison Square Garden. Macy's Thanksgiving Day Parade: This beloved annual parade is the world's largest and features huge balloons of well-known characters from pop culture. The day before the parade the balloons are inflated outside the American Museum of Natural History. Veterans Day Parade: This yearly parade is the country's largest Veterans Day event and honors those who have served in the U.S. military. Holiday Windows on Fifth Avenue: Ornate holiday displays decorate the storefront windows of Saks Fifth Avenue, Macy’s, Barneys, Bloomingdale's, Tiffany & Co., and more stores in Midtown. Rockefeller Center Christmas Tree Lighting: Every year since 1933, there has been a public lighting ceremony for the giant Christmas tree that presides over the ice-skating rink. The tree remains lit through early January. If you're planing to visit during Thanksgiving, book accommodations well in advance. To watch the parade, book a hotel on the parade route. The location offers easier access to the parade and several hotel reserve space immediately in front of the hotel for guest-use only. Election Day is the Tuesday after the first Monday in November and New York City public schools are closed on this day. This means that there are many more people at various museums and other attractions. Veterans Day, November 11, is a federal holiday, which means banks and post offices are closed. New York City public schools are closed this day. To learn more about if you want to visit New York City in the fall, check out our guide on the best time to visit.